HANS ULRICH OBRIST is the co-director of the Serpentine Gallery in London. His most recent book is the recently published Ways of Curating. Since the 1960s, John Brockman's pioneering activities have been diverse and multidirectional, marked by a fearlessness and fluidity of thought. He has been a writer, a literary agent, a junction-maker between science and art, a curator, an avant-garde-film programmer, has worked in industry, for the Joint Chiefs of Staff and for The White House. He is also the founder of Edge Foundation and editor of Edge.org, an important platform for the exchange of knowledge between different fields that aims "to arrive at the edge of the world's knowledge". Stewart Brand has called Brockman an "intellectual enzyme … an adroit enabler of otherwise impossible things". As Brockman himself puts it, "I look to … those who through their empirical work are changing the nature of ourselves and reality, whether they are scientists or not … people who are using technology and new communications ideologies to radically reboot the whole idea of human communication." First and foremost, he is driven by the question: "Who … will take us to the epistemological crossroads where everything has to be rethought? My entire career has been in pursuit of this vision." Central to this approach is Brockman's fundamental opposition to the separation of art and science. Instead, he sees art as science and science as art. This way of thinking beyond the boundaries is a guiding theme that defines his activities, which focus on establishing networks. He "celebrates thinking smart versus the anesthesiology of wisdom", where experts ask questions not "in front of their peers in their academic discipline or their field, [but] in front of people who are their equals in other areas." This is why, when I first met him in the summer of 1998 at his farm in Connecticut, he became one of my great inspirations, reinforcing my conviction that pooling knowledge across disciplines is the future. In one of our many conversations over the last fifteen years, Brockman remarked that "Life is the theatre of one chance." His life and work have been greatly informed by this idea. In 1964, he met the artist and filmmaker Jonas Mekas, who was running the Film-makers' Cinematheque for underground cinema. Brockman was already working with underground film-makers, and video artists, which was at this time a revolutionary art genre. In 1965 Mekas asked him to take over the Cinematheque and to initiate an Expanded Cinema Festival there. He invited many great New York artists working in all fields, including Nam June Paik, Andy Warhol, Robert Rauschenberg, Robert Whitman and Claes Oldenburg, to make a work integrating film for a special performance. These activities led to an invitation from leading scientists in biophysics, computation and cybernetics to bring a group of New York artists, film-makers and musicians to MIT in Cambridge Mass., for what was probably the first art-science symposium – an event that would have a lasting impact on his thinking and methods. Out of his experiences in the avant-garde art world of New York, Brockman's writings were quickly evolving. His first book, By The Late John Brockman (1969), was introduced in 1968 as part of a six-evening avant-garde event at The Poetry Center at the 92nd St Y in New York. Preceding and following Brockman on the programme, respectively, were evenings by John Cage and Jorge Luis Borges. This was the era of The Living Theatre, of Antonin Artaud's "theatre of cruelty", and the management of the Poetry Center had trepidation about Brockman's event—and rightly so. His "reading", a performance piece, orchestrated in collaboration with Ken Dewey's Theatre X and artist group USCO, was an attack on the values of the Poetry Center itself. The evening turned into a riotous affair—enraged audience members stopped the show five times, closing the curtains, stealing the scripts, harassing the performers, turning off the lights. By The Late John Brockman, his second book, 37 (1971), and a third book intended as volume three of the trilogy, were published together in a paperback in 1973 under the title Afterwords. They were a response to the idea of cybernetics. The first book looks at all human theory through the lens of information theory; the second examines Heisenberg's theory of indeterminacy, and the third investigates the limits of words as tools for understanding. ". . . a brain is required to write a theory of a brain. From this follows that a theory of the brain that has any aspirations for completeness has to account for the writing of this theory. And even more fascinating, the writer of this theory has to account for her or himself. " That year Gregory Bateson and Margaret Mead increasingly talked about patterns and processes, or "the pattern that connects". They called for a new kind of systems ecology in which organisms and the environment in which they live, or which they study, are one and the same. They were henceforth to be considered as a single circuit. It was only after Afterwords was published in early 1973 that Brockman met Bateson, Mead, and von Foerster. In April of that year, a group that included von Foerster, Bateson, Zen philosopher Alan Watts, and dolphin researcher John Lilly, convened the legendary AUM (American University of Masters) Conference in Big Sur to study G. Spencer Brown's book, Laws of Form. The premise of American University of Masters was that it was comprised of those maverick intellectuals whose authority derived from their persona, ideas and work, and not from their institutional affiliations. Brockman, on the strength of his trilogy, was summoned at the last minute to replace the keynote speaker Richard Feynman, who had been hospitalized. Later, in a visit to Brockman in New York, Bateson told him "The cybernetic idea is the most important idea since Jesus Christ. And it's an idea that's foreign to almost every so-called intellectual among mainstream thinkers." However, it was an idea that was pervading the art world at this time. John Cage, for example, was interested in how ideas and patterns move through cultures, while Nam June Paik's videos were, in Brockman's words, "an example of the cybernetic idea in action". "The cybernetic idea was not about 'a' and 'b' ", he recalled; "it was about a process and the process was the reality." Each of his books is made as a process, performance or experience, recalling the Duchampian idea that the reader/viewer does at least fifty percent of the work. Brockman takes this idea even further in his belief that the reader owns the words, which makes his books highly performative in the moment of reading. In this, his writing anticipated the ideas of Bateson and Mead concerning the necessity of considering the ecological nature of the organism and its environment as a single circuit. Brockman calls it "undifferentiated activity". "The entire work is performance piece that in all parts are the whole, undifferentiated as activity, where you can't tell who the subject is, you can't tell what the subject is.” To him, the writing is demanding, physical, and exhausting, requiring the reader to constantly keep in mind the complete work, i.e. the single circuit. Pre-empting the ebook by many decades – or conversely, recalling ancient scrolls – the first edition was printed on one side of the page only. Brockman had told his editor at Macmillan: "It is obscene to print on both sides of a page." Although the reception to Afterwords in 1973 was decidedly mixed, comments when it was nominated for the long list of 10 books for the National Book Award, ranged from "Trashiest specimen of newly proliferating genre of electronic dada" (Kirkus), to "The best book since Wittgenstein's Tractatus" (Alan Watts); from "Terrifying … depressing … cerebral … icy" (Vogue), to "There are certain writers whose thought is so important that it doesn't matter whether you agree with them or not. A verbal tension so powerful, an ascetic appetite so huge and consuming forces us both to accept the vision as a revelation and to resist it as a duty." (San Francisco Review of Books ). 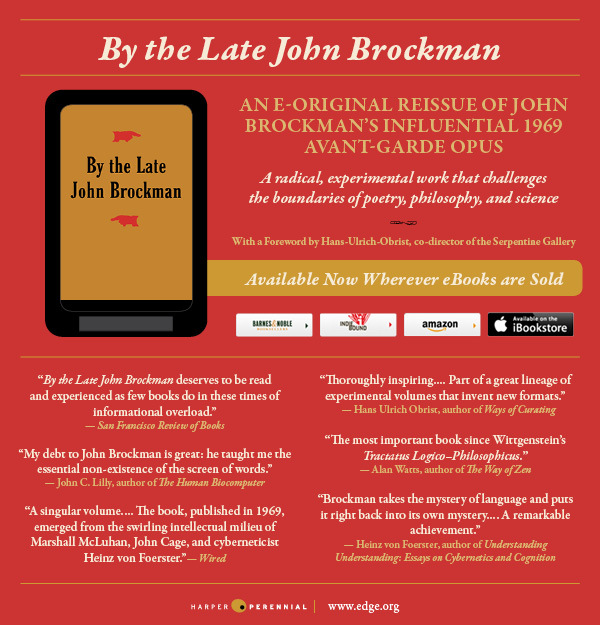 The publication of Afterwords was followed by a volume of essays entitled After Brockman: A Symposium, in which artists, poets, writers, and scientists wrote about the importance of Brockman's trilogy. Later that year, Brockman, at thirty-two, retired from writing (although he has managed, over the past forty-odd years, to publish dozens of books in his various roles as editor, producer, impresario). The trilogy, re-issued under the title of the original volume, By The Late John Brockman, is part of a great lineage of experimental volumes that invent new formats, from Laurence Sterne's Tristram Shandy, written in the 1750s/60s – the first example of a book using variationrs in typography and deliberately blank pages – to Cage's A year from Monday, an aphoristic collection that inspired Brockman's interest in the book as experience. The artist Richard Hamilton once remarked that we only remember exhibitions that invent new rules of the game. This welcome new edition of Brockman's work is a thoroughly inspiring reminder of the fact that this observation can also be applied to books.